You can find beauty and fashion tips almost anywhere, but few compare to those from the Queen of Style herself—Marie Antoinette. As a trendsetter and “It Girl” of her time, she deliberately deviated from the more traditional styles of the time as a way of exercising power over the masses. Since she had no real political authority to wield, she did so with her glamour, and the fashion trends followed. Many of her beauty secrets were so effective, they’re still used by women today. 1. START WITH A GOOD, STRONG CLEANSER. DIY skincare routines like this one were commonplace in 18th century France, because people believed they would help ward off illness. While regular full-body bathing was not the norm, facial cleansing was done more often, because products could be made from simple, household ingredients (and pigeons, of course). 2. THE CLEANER AND PALER YOUR SKIN, THE BETTER. Once her face was sufficiently cleansed, Marie Antionette applied her astringent of choice, which was Eau des Charmes. Finally, she’d cover her face and neck in a whitener called Eau d’Ange. Pale skin was all the rage in the 18th century. It denoted someone of wealth and nobility, because it proved you didn’t have to work outside in the sun. Skin whitener also helped hide marks and blemishes, which were often remnants of diseases—something with which the upper class never wished to be associated. 3. NIGHTLY BEAUTY ROUTINES ARE ESSENTIAL. In order to keep her hands soft, the Queen would wear gloves filled with wax, rose water, and sweet almond oil to bed every night. According to Melanie Clegg, author of Marie Antoinette: An Intimate History, she also applied saffron, turmeric, sandalwood, and rhubarb to her hair to maintain her strawberry blonde color. While she often wore wigs that would cover this color, she likely would’ve gone wig-free when she was receiving guests in her more relaxed salon in the afternoon. That meant that a pleasing natural hair color was essential. 4. BATHE YOUR BODY REGULARLY. Despite being a frequent bather, she, like many other wealthy women of her time, would wear a bathing chemise to protect her modesty while in the tub. While sitting on a large pad filled with pine nuts, linseed, and sweet almonds, she washed her skin with scented bar soap and exfoliated with small, bran-filled muslin pads. 5. MAKE YOUR SKIN GLOW WITH A DIY FACE MASK. Her signature face mask consisted of four simple ingredients: cognac, one egg, powdered milk, and a lemon. To make it, all you need to do is blend 2 teaspoons of cognac, one egg white, a third cup of powdered milk, and the juice of one lemon into a paste. She believed that the lactic acid in the milk and citric acid in the lemon dissolved dead skin cells, while the cognac stimulated circulation and tightened the pores, and the egg repaired skin tissue. 6. YOU CAN NEVER HAVE TOO MUCH PERFUME ON AND AROUND YOU. Because of its history as a rural hunting lodge, Versailles had a long history of sewage problems. (And it wasn’t just limited to Versailles. Rousseau once complained that there was nowhere to sit at the Palais Royal in summer without “inhaling the odor of stagnant urine.”) But the Queen did not stand for that. She had her chambers filled with fresh flowers, potpourri, sweet-smelling oils, and perfumes. On top of that, she doused herself in a variety of scents including violet, rose, vanilla, lavender, jasmine, lily, cloves, and her favorite, orange blossom. 7. YOUR MAKEUP BASE SHOULD BE THE WHITEST WHITE. 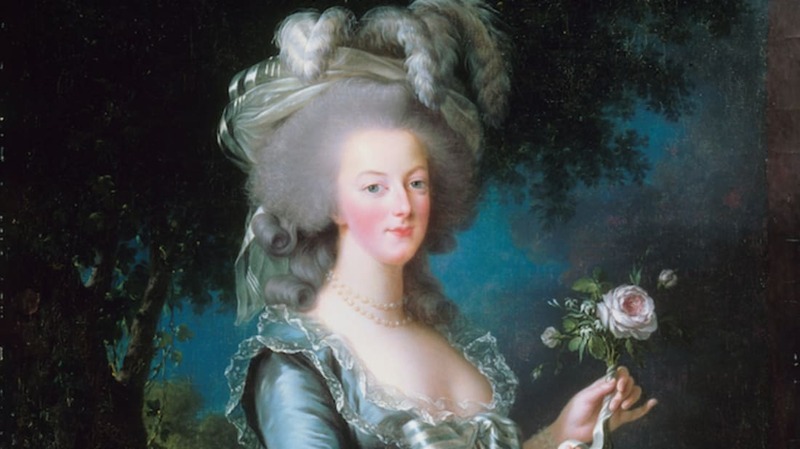 The other reason alabaster skin was so popular during Marie Antoinette’s time was because of the smallpox epidemic. Those who survived it were often left with deep pockmarks on their faces. And the thick, white face powder was one of the only things that masked them. If that didn’t do the trick, ladies would apply little black beauty marks often in the shapes of hearts, stars, and moons. 8. ROUGE IS THE ONLY ACCEPTABLE CHEEK AND LIP ENHANCEMENT. To offset her extremely pale skin, Marie would often apply rouge to her cheeks and lips. Marie’s coloring was usually procured from carmine, an insect-based pigment that was mixed with an acid, and then with alum. However, this combination was extremely expensive, so for everyone else, popular and cheaper alternatives included minium, also known as red lead, and cinnabar, the ore of mercury. Neither were known to be dangerous until the early 19th century. 9. WEAR YOUR HAIR BIG AND BOLD. Marie Antoinette is a big part of why women in the 18th century sported hair that resembled giant cumulonimbus clouds. She popularized the pouf—a hairstyle support device designed by French stylist Léonard Autié that allowed women’s hair to tower as high as 2 feet above their heads. The pouf gave women the opportunity to show off their personalities with their strands. Marie would often accent her hairstyles with animals, birds, flowers, and any number of other novelty items. The styles took hours to complete, and involved starting with a thin wire frame and triangular pillow to hold the shape. The woman’s hair would then be incorporated along with false hair and wig pieces to achieve the desired look. Marie’s mother, Marie Theresa, was not a fan of her daughter’s bold style, and even wrote her to tell her so. But that didn’t stop the Queen from creating hairstyles so big they wouldn’t fit into her carriage. Marie Antoinette’s clothing collection would have put Cher from Clueless (1995) to shame. It easily filled three rooms at Versailles. Marie had 120,000 livres a year (which would’ve equaled almost $4 million today) with which to buy clothes and accessories—a massive allowance for anyone of exorbitant wealth. However, she often managed to overspend. One year, she mounted up a bill that was more than twice her allotment. She’d have hoards of dresses designed by Rose Bertin (the premiere dress designer of the day), with names like “Indiscreet Pleasures,” “Heart’s Agitation,” and “Stifled Sighs,” each costing anywhere between 1000 and 6000 livres. 11. ... BUT NEVER WEAR AN OUTFIT MORE THAN ONCE. According to royal etiquette, the Queen was only allowed to wear a gown once, and was supposed to change her outfit three times a day. As you can imagine, this did not help her stick to her yearly allowance. She occasionally held onto some of her favorite dresses (for sentimental value only), and gave the others away to her ladies in waiting. Every morning, she’d be presented with swatches from her many new gowns, and she’d put pins in the ones she wanted to wear that day. They’d usually be a heavier dress for Mass, a lighter, muslin option for afternoon play, and a fancier choice for evening events. Needless to say, she spent a large percentage of her day changing.